Hello, sunshine! Summer has officially arrived, and we couldn't be more excited for three months of sandals, sangria, and warm, starry nights. Planning your wedding this season? Below, check out five of our favorite trends for sunny celebrations. When things start to heat up, hemlines rise and necklines fall. We love bridal gowns with boho flair—billowy sleeves, cotton lace, crochet details, fringe—for outdoor weddings in the desert, mountains, or at the beach. Gown by Portland bridal designer Elizabeth Dye. 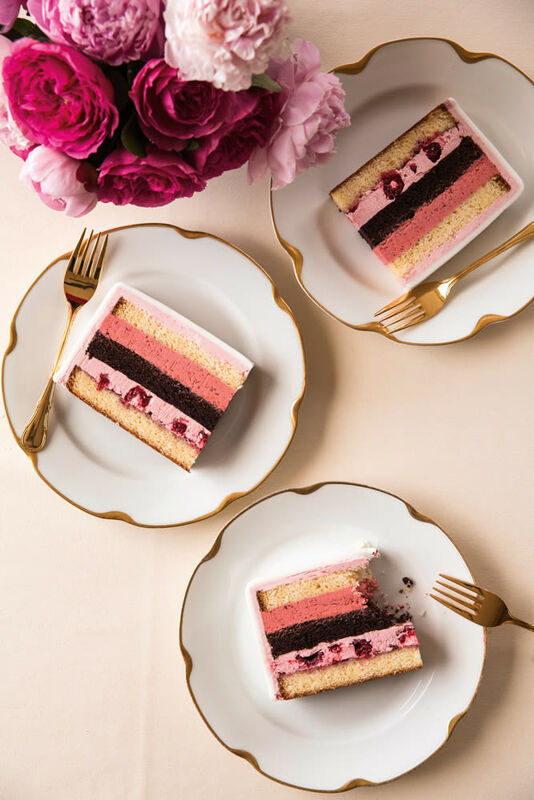 Take advantage of the season's ripe, juicy fruit—raspberries, strawberries, and blackberries are tops on our list—and serve a berry and buttercream cake, like this layered raspberry confection by La Joconde Cake Studio + Bakery. Raise a toast to your new relationship status with a glass of bubbly. For warm-weather fêtes, we love sipping on champagne, cava, prosecco, and sparkling rosé wines, or mix things up with a signature champagne cocktail featuring fresh fruit, herbs, or elderflower liqueur. 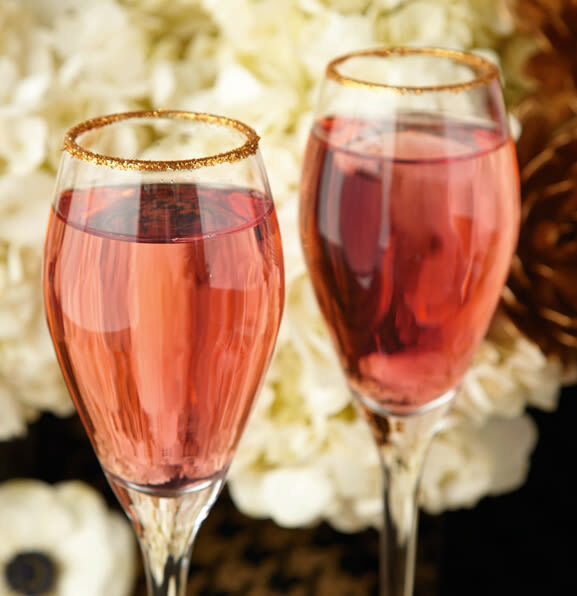 Sugar-rimmed champagne cocktails by Pearl Catering. 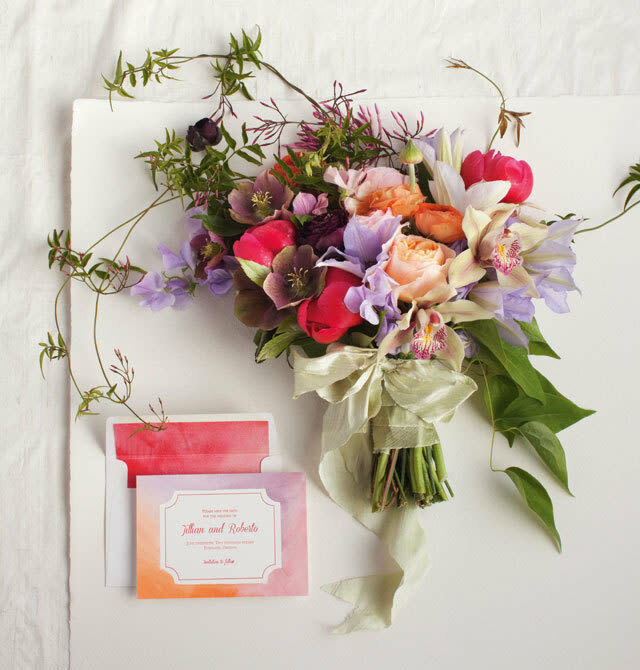 Hand-painted, watercolor details like this invitation suite by Lettuce Press and coordinating bouquet by Anna Mara Flowers are a pretty way to add pops of color to your big day. We also love watercolor wedding cakes! Similar to watercolor styles, we love the soft, romantic look of this ombré-hued cascade bouquet by Decoration Inc. To keep the trend current, stick with a tonal palette like these warm pink, coral, and peach hues. Photo by Britt and Peter Chudleigh.